Ocean & Sea was established in 2013 as a creative vessel for local designers, Brendan & Amanda O’Shaughnessy. Ocean & Sea carries our favorite local t-shirt, "The Heart." We love the tee and the inspiration behind it: Kansas City bridges the ports both geographically and figuratively. The shirt is made in the USA and printed in KC. The fabric is comprised of a tri-blend mix (50% Polyester / 25% Cotton / 25% Rayon) which yields a super soft, shrink-resistant fit. It comes in heather grey or turquoise and runs for $32. Available here in our shop // or at OceanandSea.com. There’s no apparel brand more worthy of mention in Kansas City than Freely Given. Its founders, Chris and Allison French, work with top designers in town to customize shirts inspired by kids and families in crisis. They then turn around to donate 90% of its profits to support the same families who inspired their designs, “one story at a time.” As Freely Given's first “story,” Ampersand Studios contributed the Go Kit Go collection to support the care of little Kit, whose incredibly brave fight against cancer will make you fall in love - both with Kit AND the Freely Given movement (but especially Kit). The Freelance brand surged to local popularity last October when "The Crown" design became one of Kansas City's hottest, and now iconic, apparel items for Royals fans. The designers have major design cred in KC beyond The Crown, having branded some of Kansas City's most popular downtown restaurants. Freelance's motto perfectly sums up their brand's personality: "Support the people and causes that you believe in and your life will be filled with peace and meaning." Local designer, Matt Baldwin, has received all kinds of love and national publicity from publications like GQ, and from celebrities like Jay-Z and Ellen. There is something really unique, and very Kansas City, about each piece that Baldwin creates. The crew in white, "Little KC," is one of our favorite ways to rep KC. This men’s slim fit crew neck tee features an open neck and relaxed lower body and runs. 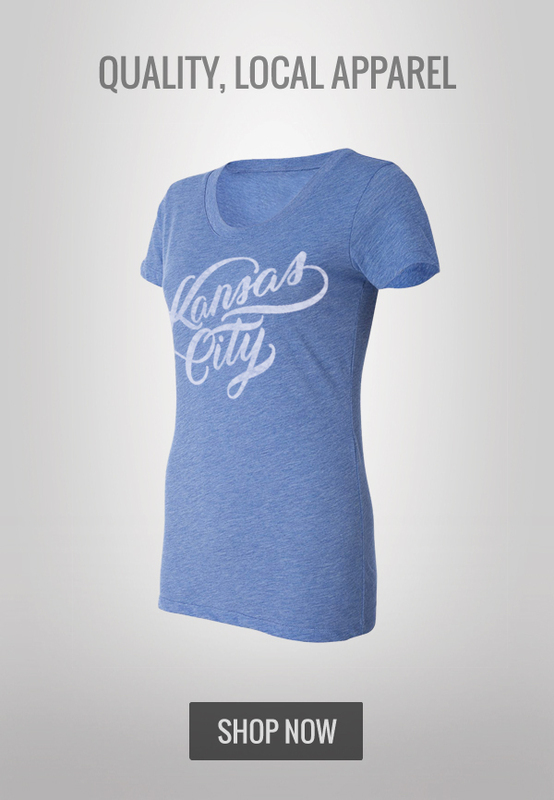 For women, we love The V in graphite "KC US." John Bosley’s name is new to KC apparel world, but his work isn’t. 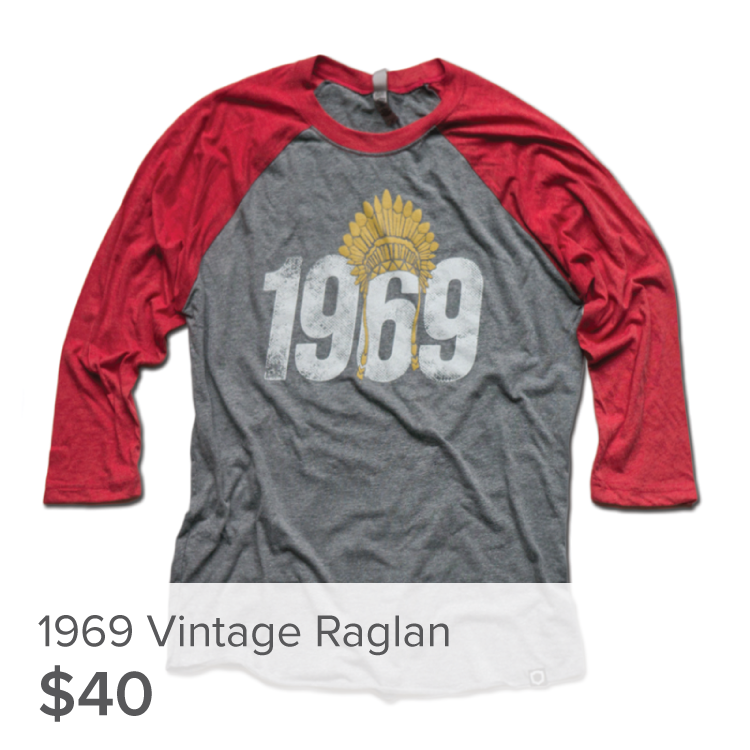 Bosley was the lead designer at RAYGUN for six years before recently breaking away to build his own design brand. Bozz’s crisp, clever illustration style features Kansas City’s most recognizable icons with aesthetic perfection. The design of this shirt is as pure as its mission: to support The Hope Lodge of Kansas City, which provides out-of-town cancer patients and caregivers a place to stay during treatment. 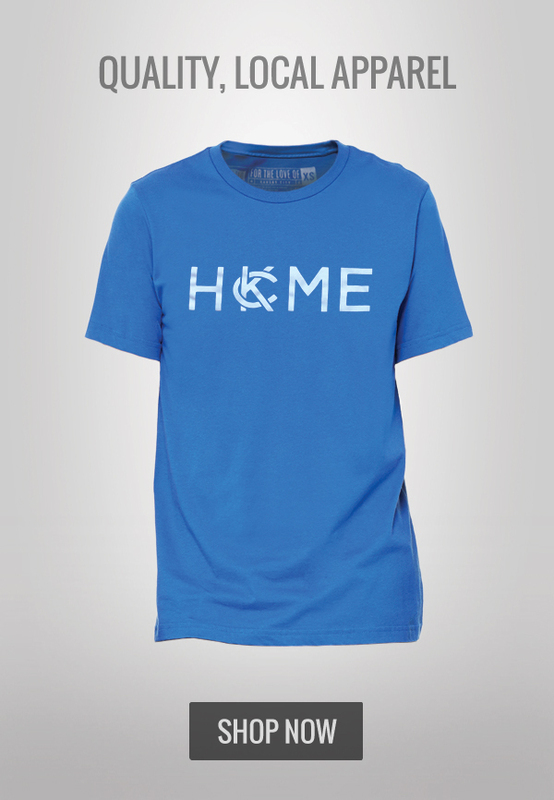 “There’s no place like home” is the fitting name for both the shirt and the cause. Each shirt purchased is a donation to these families; 50% of all proceeds go to support Shave 2 Save, an annual fundraiser for the Hope Lodge. MADE Urban Apparel was co-founded in 2012 by three friends working together for "the man." They decided to collaborate by turning their artistic skills and ambitions into reality. The "816" tee is from their "strength in numbers" collection and features front and back print. Like all their products, the t-shirt is Kansas City made. We also love the "Always Royal" tee from their "Trust your Struggle" collection. Made in the Middle is a showcase of Kansas City’s most elite in the creative community, from designers to musicians to chefs. So there’s nobody better to represent KC’s best in BBQ than the guys at MITM. Tad Carpenter and team partnered with Joe’s Kansas City, Jack Stack and Gates to create the Sauce Series: a limited edition trio of shirts slathered in KC culture. You’ll find more well-crafted points of local pride in their shop as well. 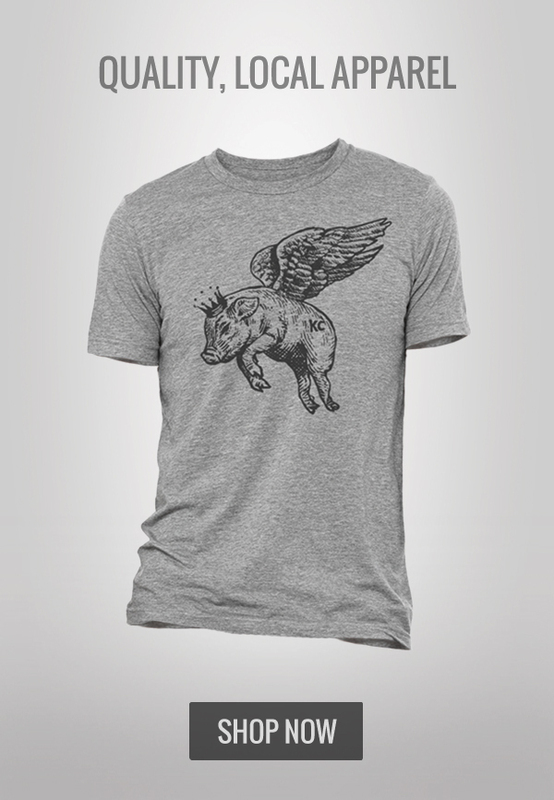 We love Kansas City Bravery Company’s collection of KC-inspired designs. The "816 | 913" tee was inspired by the iconic logo of Run DMC and is printed on the American Apparel track shirt. Another favorite of KC Bravery's thoughtfully designed collection is "UNITE, KC" shirt, featuring each county of the city. Charlie Hustle has earned icon status in Kansas City. The vintage t-shirt company is out to preserve the old school using the t-shirt as a canvas for artistic expression. 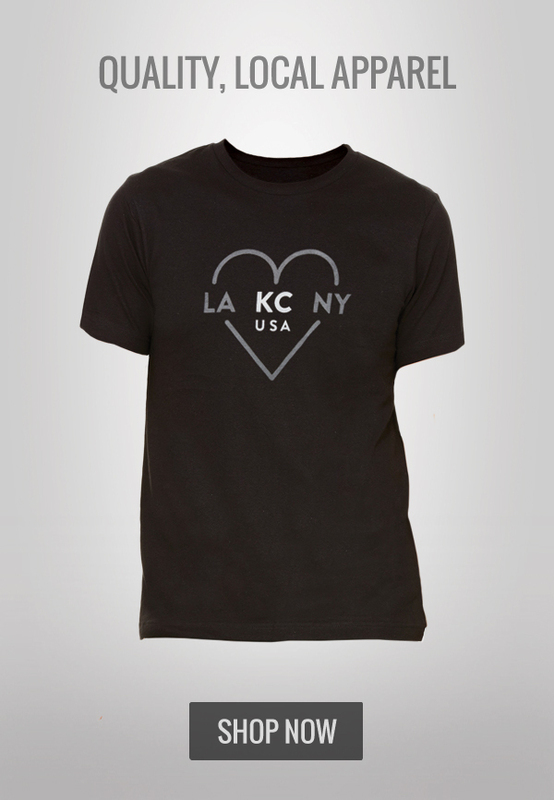 The "KC Heart" t-shirt is a staple tee of the Charlie Hustle brand, representing their hometown of Kansas City, the Heart of America. Made with polyester, rayon and cotton, these super soft tees come in multiple colors and styles, including children’s versions. We love Sandlot Goods. Katy, Chad and Ryan started the company with the idea that every product would give a nod to the simplicity of our past and connect us to the good old days. Their old-school P.E.-type shirt, "Made In KC," is growing into a recognizable icon around the city. Parkway Prints is a full-service print shop specializing mostly in screen-printed apparel items. "Kansas City Streets" is a simple design on a heather gray shirt featuring some of KC's most popular streets, west to east, from Broadway to Troost. Their "KC Monogram" t-shirt features the new Kansas City, Missouri logo on a surprise shirt. You tell them which size, and for $10 they’ll pick a color. 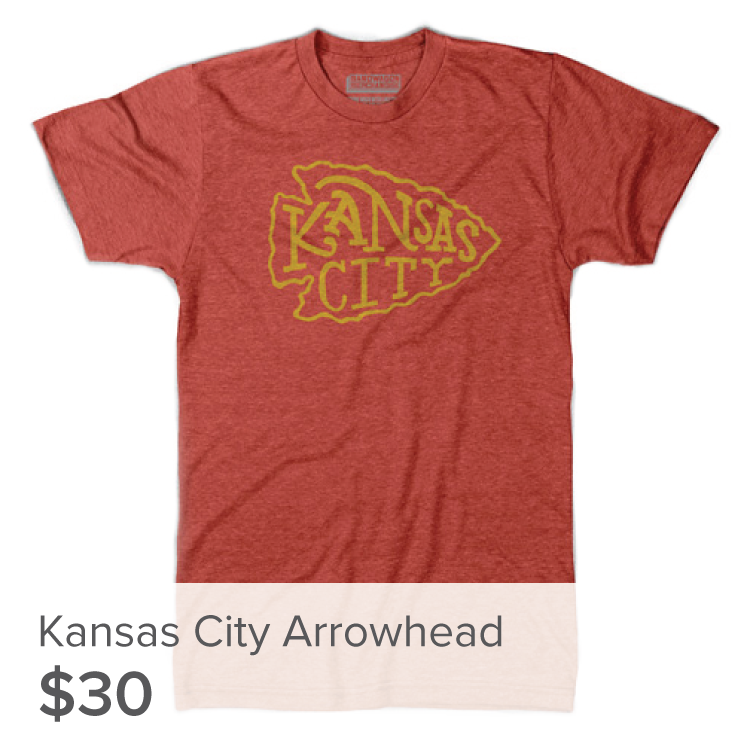 Kansas City Arrowhead and Royal baseball shirts available in our Shop // or at ParkwayPrints.com. Maker Village KC has made it their goal to lower the barriers into the maker movement for Kansas Citians. They are currently rehabing an old commercial building at 31st and Cherry, where they plan to open a community workshop providing people access to commercial woodworking and metal working equipment for prototyping and small-batch production. MVKC is geared to inspire and enable entrepreneurs, craftsmen/women and artists. Their "Maker Village Logo" t-shirt is screen printed locally and manufactured in America by American Apparel. Normal Human is a retail screen-printing shop located in Westport, KC. The shop sells original designs on shirts, aprons, tote bags, cards, tea towels, baby clothes, pet apparel and more. Their super soft KC Hoodie runs for $48 and is printed on Alternative Apparel's unisex Eco-Heather Zip Hoodie. 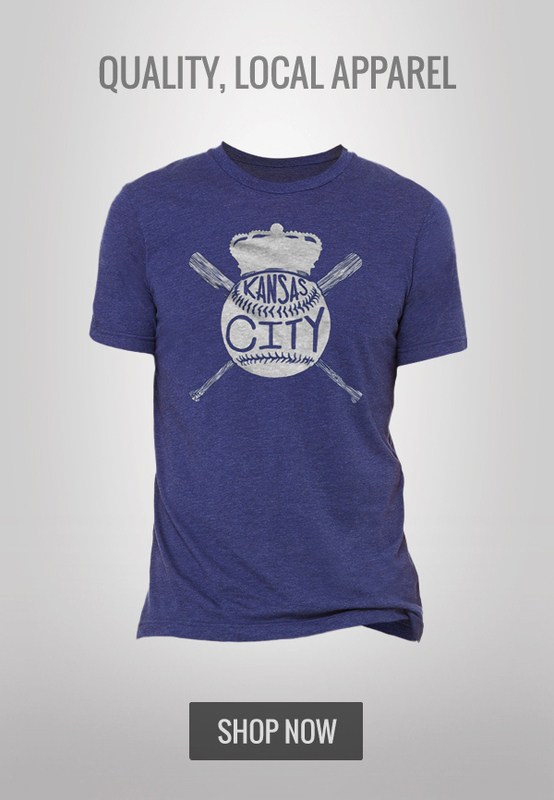 We also love their KC Wheat Baseball Unisex Tee for $26, printed on tri-blend athletic gray American Apparel unisex tee. 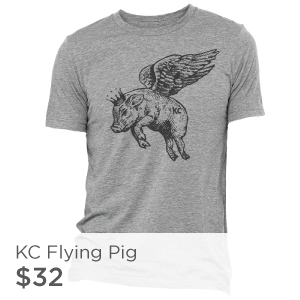 One of KC's most popular spots to buy many of these t-shirts makes some pretty great designs of their own. The KCMO t-shirt is a local favorite and is available in different designs and colors. They're vintage. They're ridiculous. They're on sale and available in our Shop // or at flatblackcult.com.